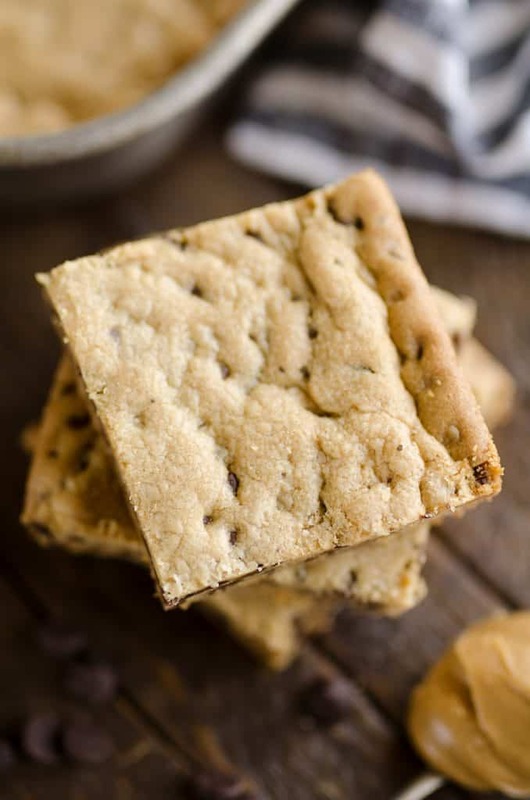 Peanut Butter Chocolate Chip Cookie Bars are a sweet and salty dessert recipe that are so quick and easy to make, the kids can do it! You know what is even easier and therefore better than chocolate chip cookies? 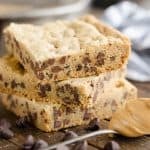 Chocolate chip cooke bars! 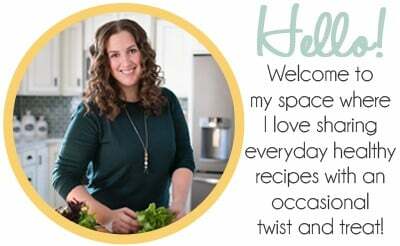 This is a quick and easy recipe my made has made from the time I can remember. 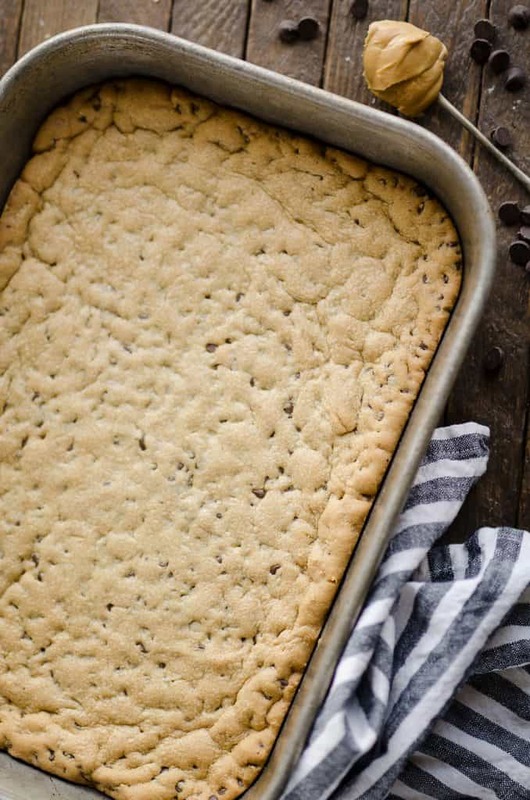 Basically you whip up a verison of chocolate chip cookie dough and press it into the pan instead of worrying about scooping out even cookies and rotating cookie sheets in the oven. While the original recipe is delicious, I wanted to add a little twist to it last time I made them. 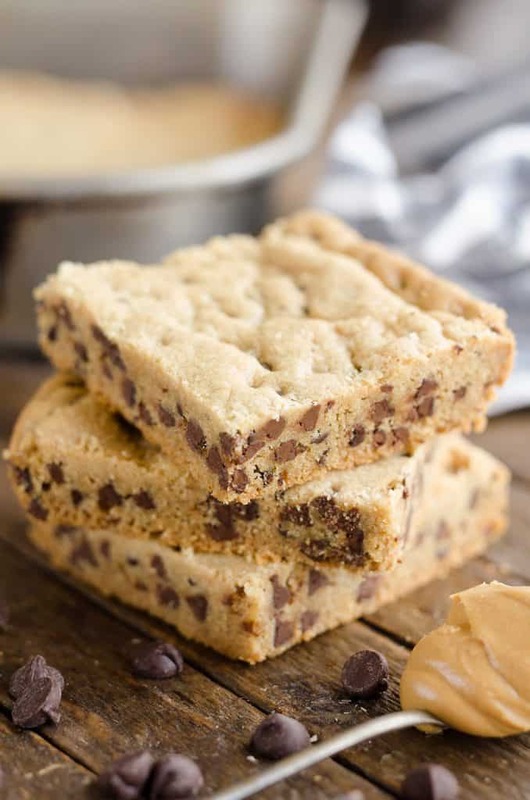 I can’t leave well enough alone, so I came up with these Peanut Butter Chocolate Chip Cookie Bars and boy oh boy are they delicious. My family loves the original recipe, but they have yet to try the new improved Peanut butter version. I love them even more than the classic, but then again peanut butter makes everything better in my book! 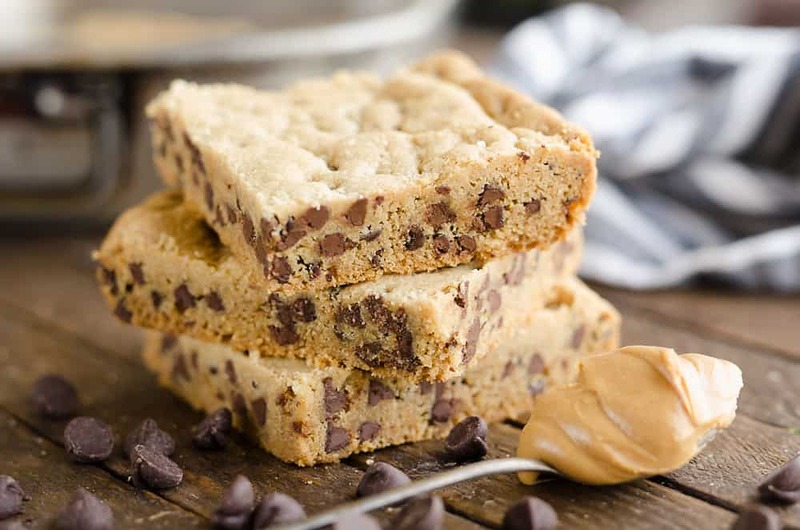 Not only are these Peanut Butter Chocolate Chip Cookie Bars drool worthy, they are SOOOO quick and easy to make. I can plop the babies in their chairs for 5 minutes and quickly mix everything up in the bowl. Stick them in the oven and I’m on my way to a sweet treat ready in just 30 minutes. If my nephews, who are a bit older, are around, they can easily help make these as well. It’s always nice to find an easy recipe that you can make with the children for something to bond over in the kitchen. They will not only love helping, but definitely love eating a bar when they are fresh out of the oven! In a medium bowl, beat the sugars, butter and vanilla. Add in the peanut butter and egg and blend until just combined. Stir in the flour, baking soda and salt until well combined. Mix in chocolate chips and spread in a greased 9x13 pan. Bake at 375° for 25-30 minutes or until the edges are golden brown. 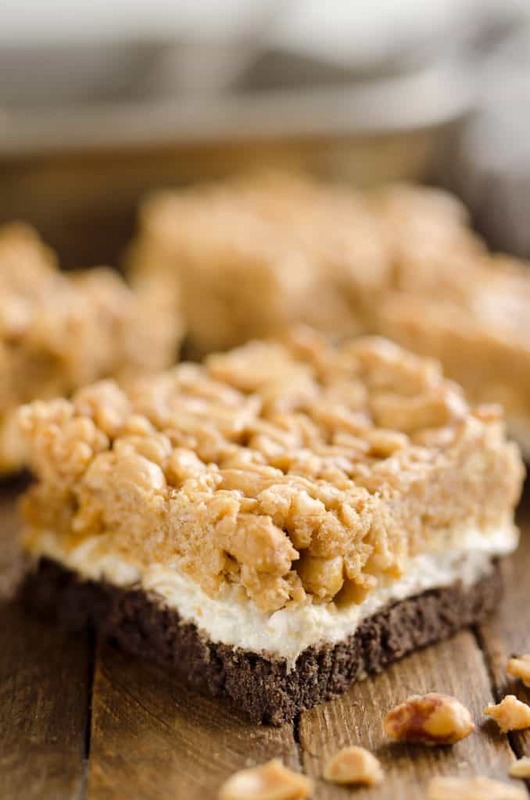 More delicious peanut butter bar recipes! 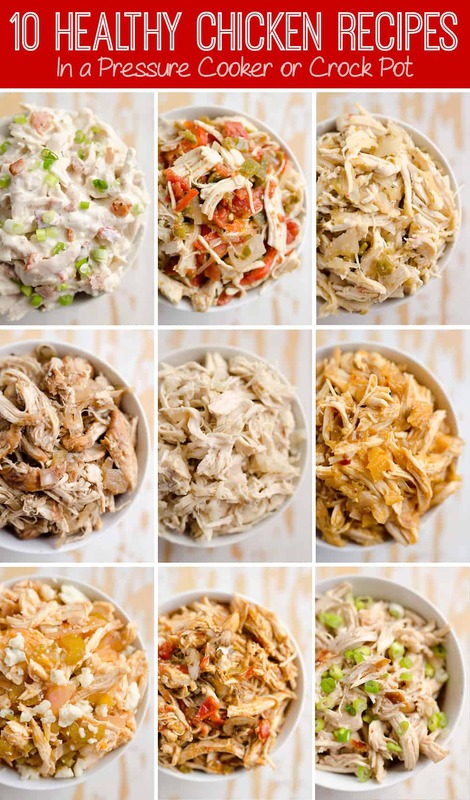 These seem like the PERFECT addition to our weekend menu!!!! YESSSS!!! I’m lazy and love turning cookies into bars!! Thanks for a great recipe! Those bars look heavenly! This is is the best combo! 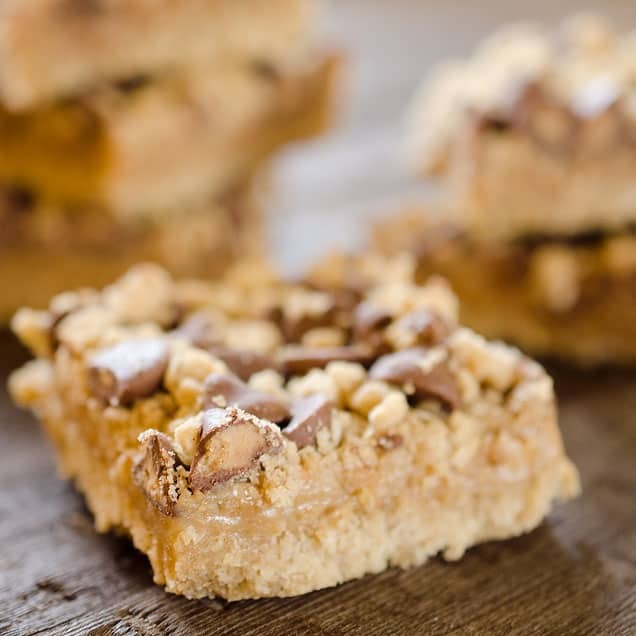 In my opinion cookie bars are even better than cookies! I can’t wait to try these! I love the cute mini chocolate chips in these! My husband would LOVE these. He’s a peanut butter addict! Can I use regular salt so I don’t have to run out and buy sea salt? And what about the peanut butter…will. “chunky” work okay in this recipe? Looks delish! Chunky should work fine, just add an extra little dollop. You can use regular salt, but I’d use a little less in that case. Recipe looks wonderful, but why not natural Peanut butter. That is actually the only kind I buy. I can’t not stand the sweetened processed kind. The consistency is different and I have not tested the recipe with it. You can try it and it may turn out good, but I can’t guarantee it.